Welcome to Measure Your World! Thank you for participating in Measure Your World! During September 29 - October 7, 2007 students from the United States, Chile, and Mexico partnered together to Measure Your World! See the results of this international collaborative activity! In the past few decades, many students and citizen scientists have attempted to replicate the technique introduced by Eratosthenes to determine the circumference of the Earth. Around 240 BC, using trigonometry and knowledge of the angle of elevation of the Sun at noon in Alexandria and in Syene, he calculated the size of the Earth. 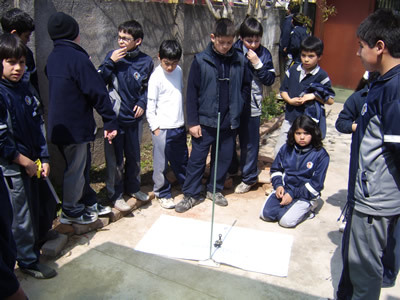 Windows to the Universe, Educared and CREA are working together to engage school children from the United States, Chile, and Mexico to collaborate together and use the Eratosthenes method to Measure Your World! Students from the Chilean team GENESIS measuring their world! Share this event with your family and friends! Download our flyer!